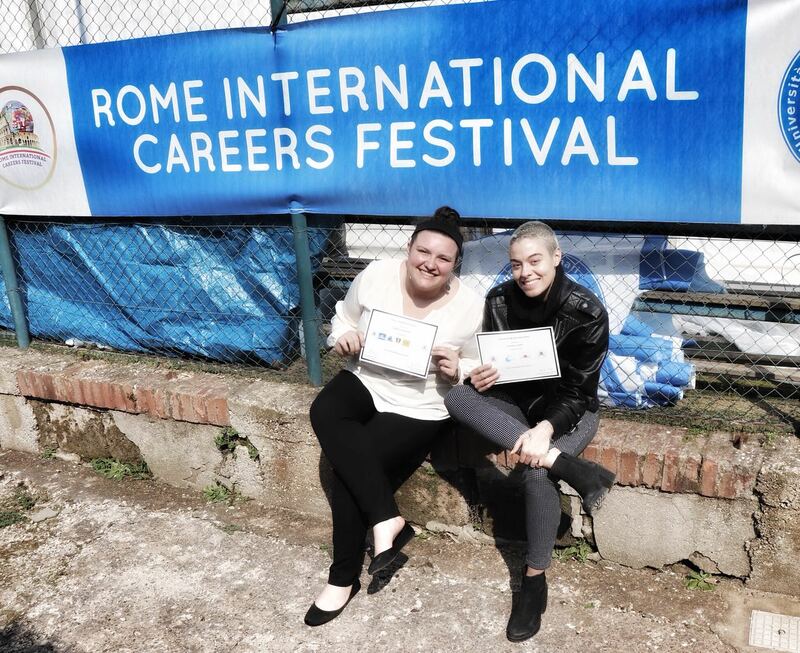 LIU Global students Samantha Becker and Tirza Crisp proudly show the honors they won at the Rome International Careers Festival in March. LIU Global students spending the spring semester in Italy came away with two noteworthy achievements at the recent Rome International Careers Festival, a four-day program that draws participants from hundreds of universities around the world. Sponsored by Giovani Nel Mondo, a non-profit organization based in Italy, the festival features the Rome Model United Nations, which recreates a diplomatic issue in international relations; the Rome Business Game, which involves case-study competitions; and the Rome Press Game, which draws on journalism and media skills to cover the conference as well as the Model UN’s simulated sessions. The event took place at the University of International Studies of Rome-UNINT. LIU Global sophomore Samantha Becker’s group won “best team” in the Rome Business Game for how they tackled the business case. Becker worked with students from seven other countries to get the job done. “This experience really opened my eyes to the business realm and see how businesses handle themselves when faced with conflicts that need to be resolved,” she said. The group that included LIU Global sophomore Tirzah Crisp won the “best team” award in the 2018 Rome Press Game, which involves journalism, international communication, interpretation and translation. This role-playing project gives participants the chance to interview Model UN ambassadors, international experts and special guests—who actually are students themselves. In the rules of the game, Crisp’s team stood out above the rest. All in all it was a good showing for LIU Global’s students.